Located along the beautiful coastline just 30 minutes west of Lisbon sits Estoril. This stylish Portuguese town is delightfully positioned within easy reach of neighbouring historic fishing port Cascais, and gorgeous Sintra. 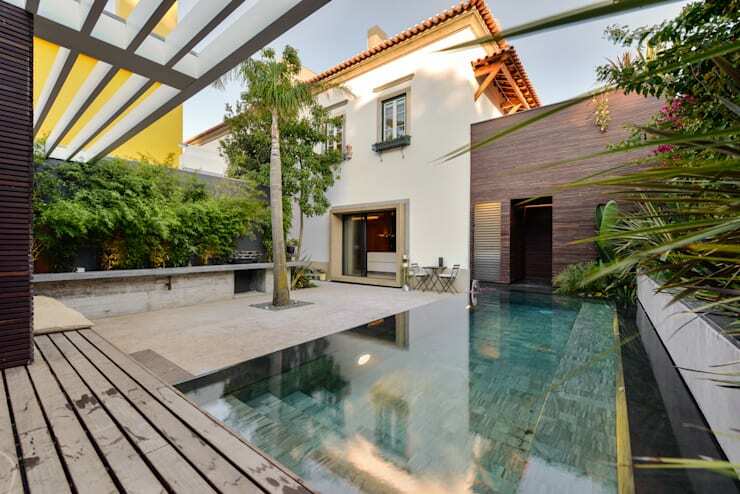 Ideally situated to take advantage of the abundant beaches, as well as vibrant Lisbon, this exclusive destination is rich in amenities such as fine restaurants, bars, beaches, and nightlife. 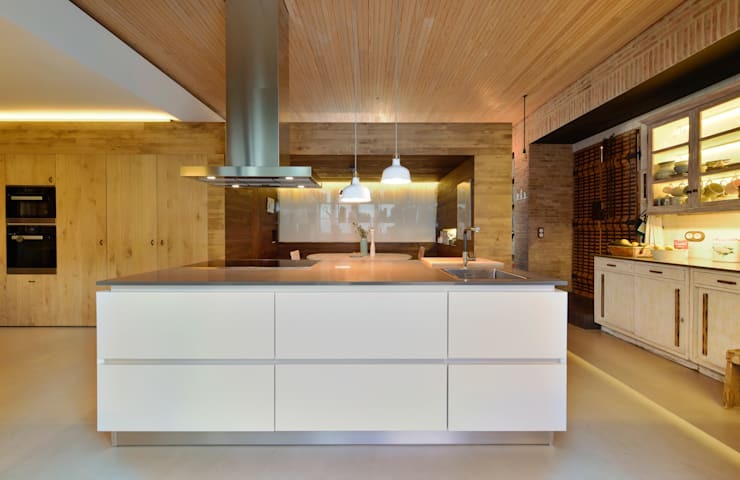 Today on homify we are touring a particularly interesting property. 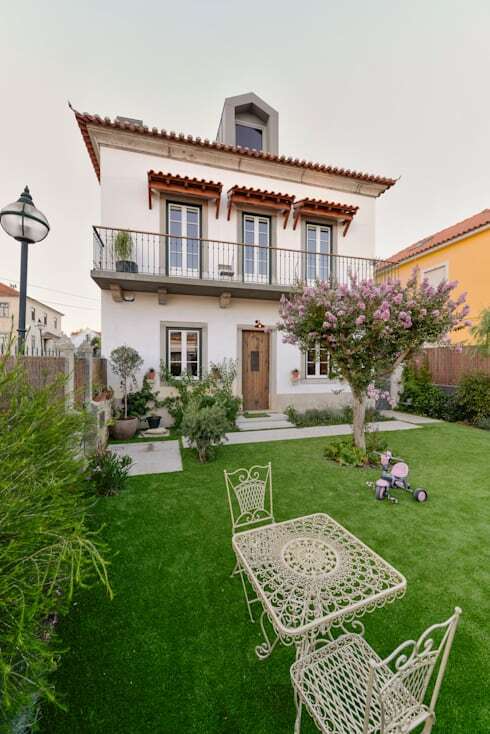 Built in 1923, this renovation project has been undertaken by Ricardo Moreno, and is the architect’s own dwelling. From the outset, this former house was very obviously in a state of significant decay, and over the years had become more or less a ruin. In order to preserve the history and heritage of the original structure, the outer walls were preserved from demolition, and instead used as a feature of the new home. The project has reinvigorated the original design, transforming the property from disused and neglected, to fabulous and unique. Boasting eye-catching features such as an in-ground swimming pool, large living areas, sophisticated internal timber-clad spaces, and attention-grabbing textures, this abode is more than simply a dwelling, it is an experience. If you would like to take a look at this amazing refurbishment and renovation, check out the images below, and get inspired to renew and refresh your home. From a crumbling ruin to a fabulous new home, this dwelling has truly undergone a transformation. 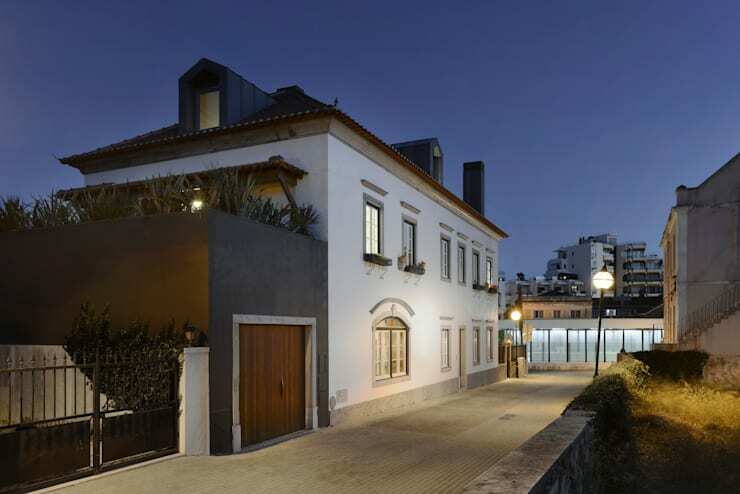 As we approach the residence from the side entrance we are able to see the garage, and the newly refurbished façade. One of the biggest challenges was to understand the techniques and materials of the '20s when the home was built. As we see here, the outer walls were built using handmade brick and stone masonry, which was then covered in lime-sand mortar. Additionally the mortar was mixed with shredded cork. This provided increased thermal insulation for the home, and adjusted the interior humidity to comfortable levels. Essentially the walls would 'breathe' and were permeable to steam. When reconstructing the dwelling, the architects wanted to ensure this eco-friendly approach was continued. Employing totally recyclable materials that required low-energy consumption, the dwelling was enhanced for 21st century sustainable living. As we turn around and enter the front part of the property, we see how beautifully the home has been renovated. Exuding glamour and luxury, the home is a perfect example of how to preserve characteristics of an original abode. The garden is wonderful for children to play within, and features a good size lawn space for garden parties, or family activities. From the outside, the dwelling looks traditional and in-keeping with the surrounding architectural vernacular. However, inside the home is a feast for the eyes and the senses. Let's take a look! At the rear of the home, within the courtyard area, the sparking new pool and huge entertaining area is seen. The pool seamlessly blends into the tiled patio space, and the continuity between water and tile is fantastic. The façade of the home is again seen, with the refreshed cream render working beautifully against the new contrasting construction to the right. Greenery is plentiful, adding a tropical vibe to the overall space. The outdoor area is large, full of life, and fantastically free from restriction. This garden gives a sense of freedom, with one being able to walk outside, into the sun, surrounded by plants, and jump straight into the water. Turning around to face the deck area, we are given a glimpse into the stunning and restful relaxation space. 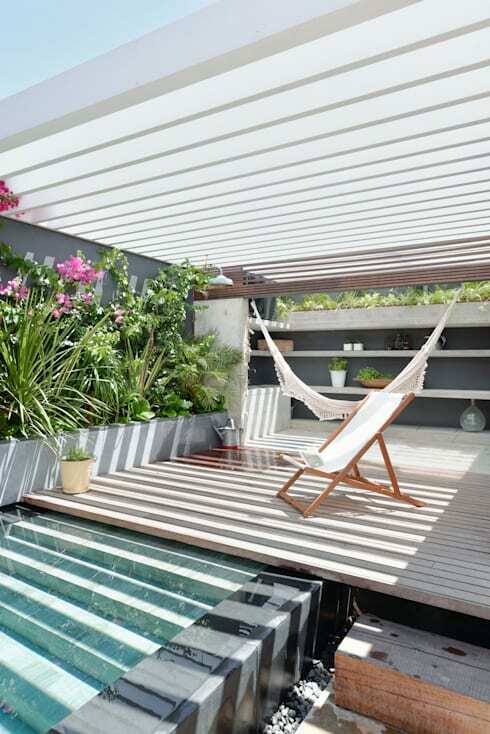 Replete with hammock and deck chair, this area is covered by a pergola style structure, allowing light into the area, while also providing shade. This patio is the ultimate in serenity and peaceful relaxation. Finally making our way inside we see the staircase and entrance floor. To the right there is a kitchen area, while behind us sits the living room and dining space. Upstairs the private sleeping quarters are located, offering solitude and soundproofed bedrooms. Throughout the home texture and tones are used to startling and striking effect. 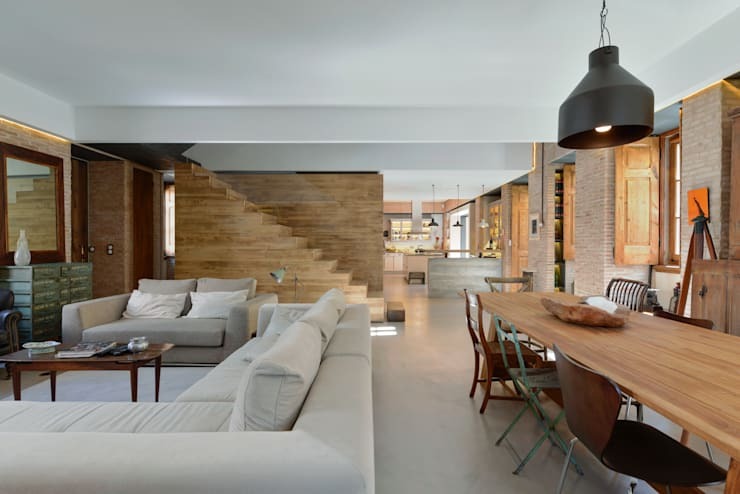 The timber doors are contrasted well against the sleek white ceilings, exposed brick walls, and concrete floor. The space is interesting and engaging, while imparting a sense of modernity with traditional influences. Looking at the space from another alternative vantage we are able to see the huge dining and living areas. Statement lights hang over the eclectic dinner space, which features many different styles of chair. The living room however, is sumptuous, luxurious and extremely welcoming. A huge corner modular sofa sits in within the space, adding to the casual comfort of the entire room. 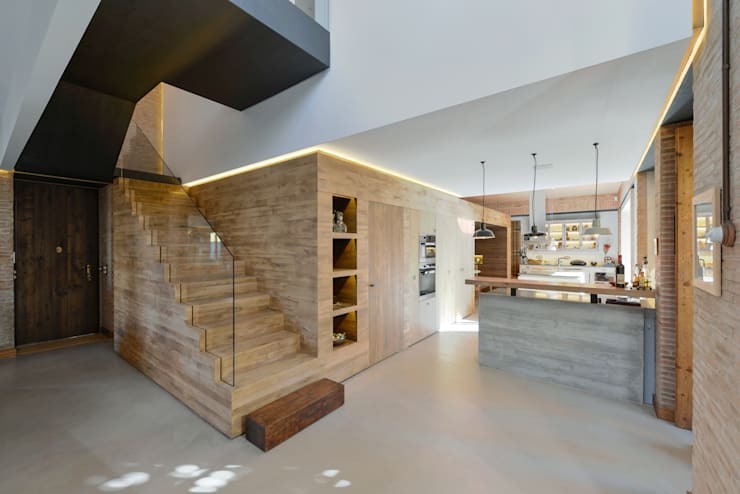 Open plan in its design, this dwelling makes the most of the original façade, and transforms it into a new contemporary dwelling. 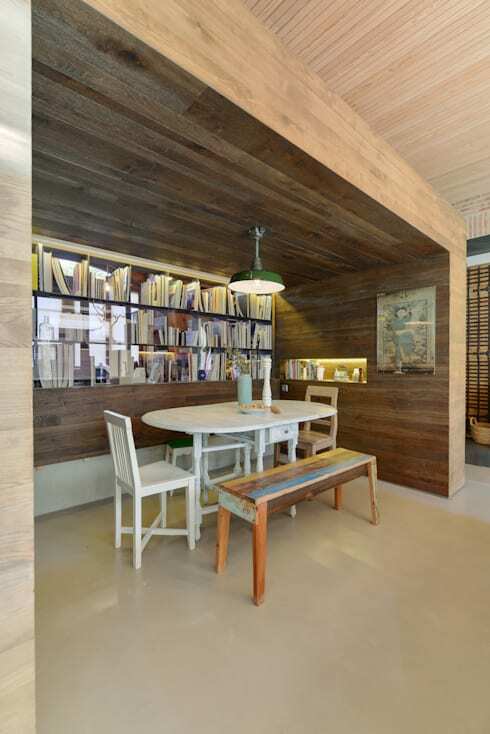 This timber-clad reading and sitting area is another feature of the home. Utilising an abundance of timber tones, and soft light with an industrial fitting, the space is ideal for homework preparation, studying, or simply taking a moment to check out a new book. There is built-in illuminated storage, and the small alcove is a brilliantly designed addition to the home. Checking out the kitchen next, we see the super-modern design and construction of the bespoke joinery. The room is a beautiful mixture of old and new. Timber-clad interior spaces impart a sense of rustic heritage, which is again amplified by the antique cupboard on the right. However, in the centre of the room, the island is ultra-contemporary, and reflects the newness of the renovation. All-in-all, this is a striking, spacious, and elegant room. 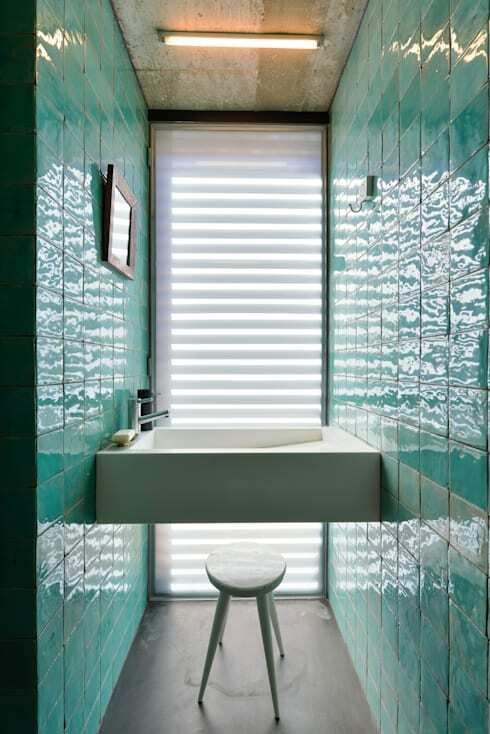 Utilising turquoise tiles and white fittings, this compact washroom is tranquil and exciting. Bright in colour, the room has a suspended basin, with a small stool for sitting or resting bath items. Floor to ceiling glass brings in a huge volume of light, working wonderfully to enhance the sense of space within the room. 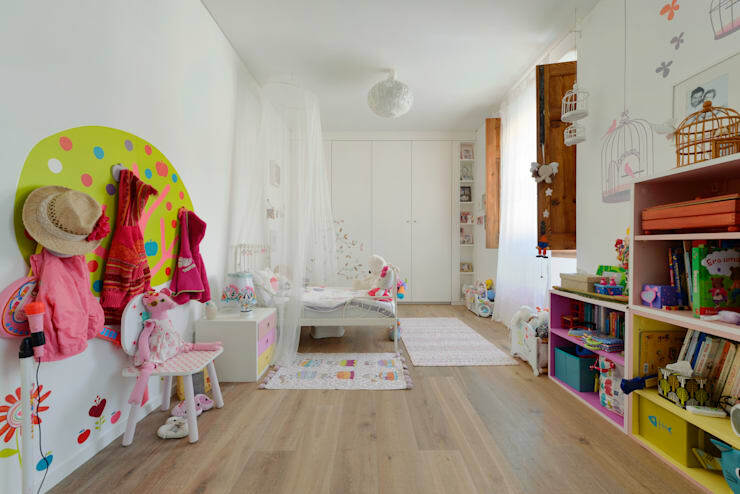 Kid's rooms can be tricky to design, as preferences and tastes change almost daily. However, this room has wonderfully incorporated all the necessary toys, furniture, and storage, while leaving the general theme open to alteration and change. The colour scheme is white, meaning it can be painted as the child ages. The overall space is adorably welcoming, fun, and perfect for a young child. The master suite is modest and restful. Although simple in its design, the designers have managed to create an area that is interesting, intriguing and unique. 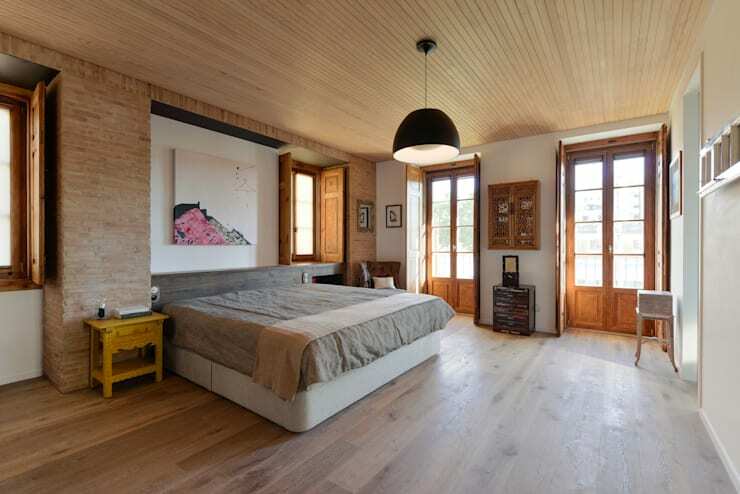 Art hangs above the bed, and works beautifully with the timber-clad ceiling. The timber window and door frames add a warmth, and paired with the laminate flooring, the room is a truly stunning sleeping space. Finally, we come to the end of this tour of this truly stunning property. To peek into one last room, we are taking a look at the loft bathroom. Replete with neutral tones, and a fabulous array of features, this space is effortlessly relaxing, and works beautifully to impart a sense of serenity. 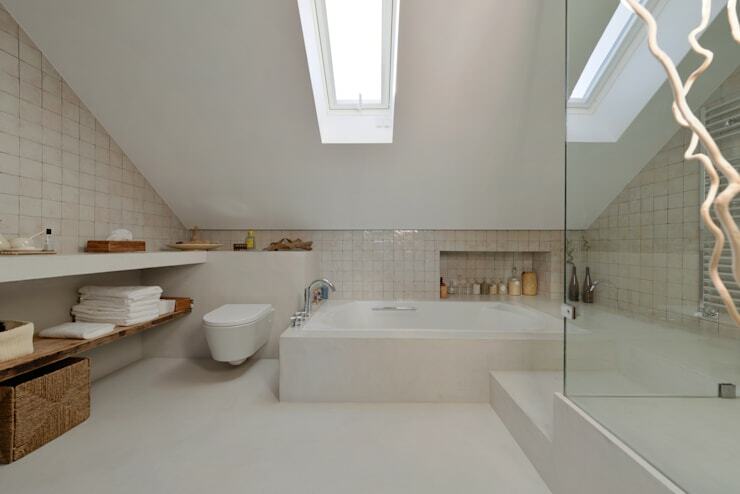 The tub is large, the shower is large, and the overall feeling is of a room much larger than a loft space. Fabulous design, within an even more fabulous home.